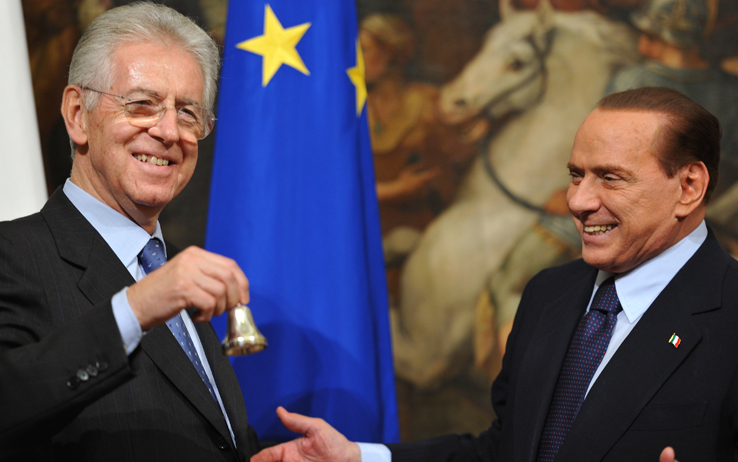 Open Europe: Silvio is back, Mario is out: What lies ahead for Italy? What lies ahead: a bumpy downhill slide; leaving of the Eurozone; and a long drawn out recovery to a mediocre condition. The longer it goes on, the longer the downhill slide, and the more mediocre the end result. With Italy being as corrupt as it is this doesn't bode well at all. Expect Berlusconi to return to power and Italy to continue to perform badly but stay in the EU and eurozone. As far as the Euro crisis rescue attempts go imho is mainly interesting in how far countries like especially Italy and Spain become dysfunctional. A sort of large Greece. This will be the trigger for a lot of things. 1. It will become a political disaster to sell rescue attempts. Rescuing Greece has probably burned half the political capital available for all Euro rescues. Completely unlikely that the Northern 'saviours' will be able to continue this process when there are more countries that basically do what they want because the structural measures cannot be sold/implemented/enforced or wharever. 2. Amounts involved. The Greek rescue basically cost more than the original Greek sov. debt. Next to the fact that this is complete and utter mismanagement if the same would happen with Italy and/or Spain you are talking 1 or 2 Trillion resp. per country. These amounts are not even close available in the present rescue mechanisms. Furthermore highly doubtful if the North want to increase these with these sort of amounts involved. 3. This all will give a lot of market pressure. Yields will go through the roof. And everybody unless part of the national suicide pact between local bust banks and governments will run for the exit. And if the ECB will give a possibility that will be used (effectively to move the risk/loss from financial sector to the mainly German taxpayer). As far as the Euro goes the level of dysfunctionality in relation to the currency and rescue will largely determine how those things will play out. With at the moment hardly enough capacity for a fully functional and high speed restructuring Spain alone. And it looks unlikely that Spain will be that (given the latest news on bail out requests, bad banks, bankrescue, deficits, unemployment and Catalunya) and that it will be alone. With Monti momentarily at least gone and Berlusconi possibly entering the political stage again, most likely we will see Spain followed by Italy going for a rescue (and subsequenly a huge rescuecapacity shortage arising). But likely the newsitems will become more frequent and more sausy. Monti is much too dull. Rejoice ! ONE traitor- and Quisling - to his country bites the dust. Now there's just Barroso, Rompuy, Draghi , the leaders of the puppet parliament and a few prime ministers around Europe too.